The Elliott Bible, translated into Algonquian by John Elliott, a Puritan missionary known as the “Apostle to the Indians,” was the first Bible printed in the colonies in 1663 in Cambridge, Massachusetts. John used this Bible in his missionary efforts. The Indians of course had no written language, but John Elliott learned Algonquian with the help of an Indian captive named Cockenoe who spoke both Algonquian and English. 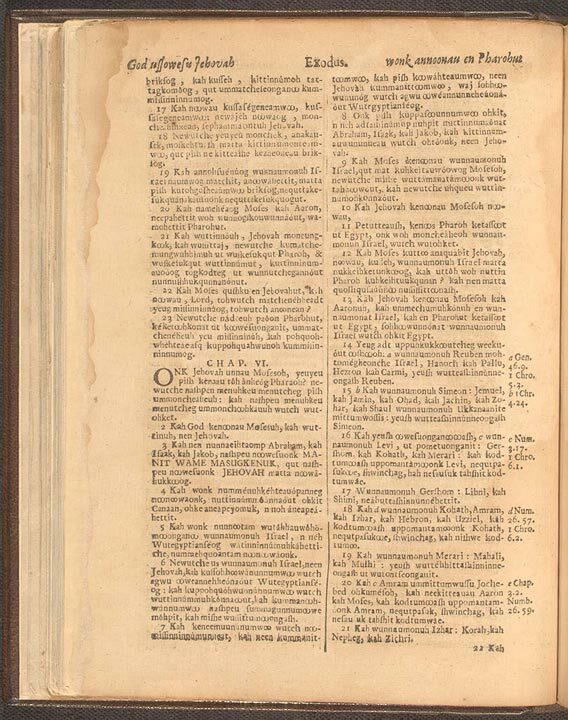 Specifically, John wrote this Bible in what he perceived to be the Massachusetts language. That Bible today resides in the Library of Congress. Hat tip to Don for this information. This entry was posted in Algonquian, Massachusetts. Bookmark the permalink. Any available copies anywhere we can get? I don’t know. I would google to see.